Named after the castles in North Wales our rooms are all decorated and furnished in traditional Edwardian country house style. Original and quirky touches add a homely and personal feel. The beds are supremely comfortable, the towels are thick and fluffy. There are three suites, all with mountain views, each comprising a large bedroom with en-suite bathroom having both walk-in shower and bath, plus a separate sitting room with a high quality hospitality area providing a sink, fridge and kettle. 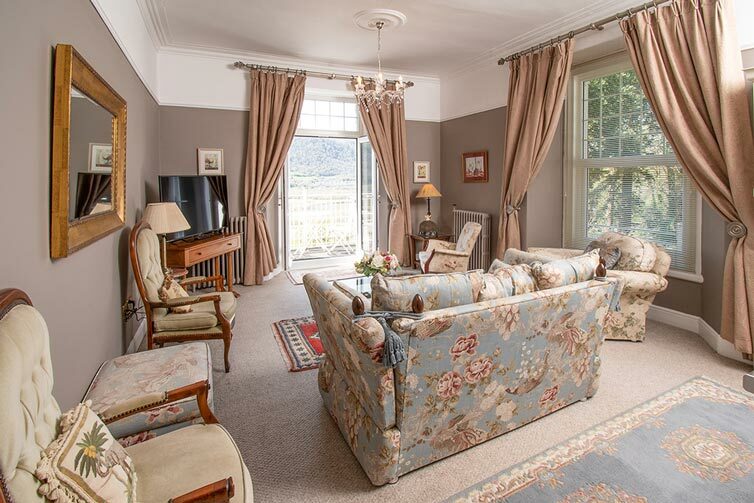 There is a comfortable dining or relaxation area with settees and armchairs where you can settle to watch TV, or simply admire the wonderful views. All suites have irons and ironing boards, extra heaters, hair dryers and many other items for your comfort and convenience. 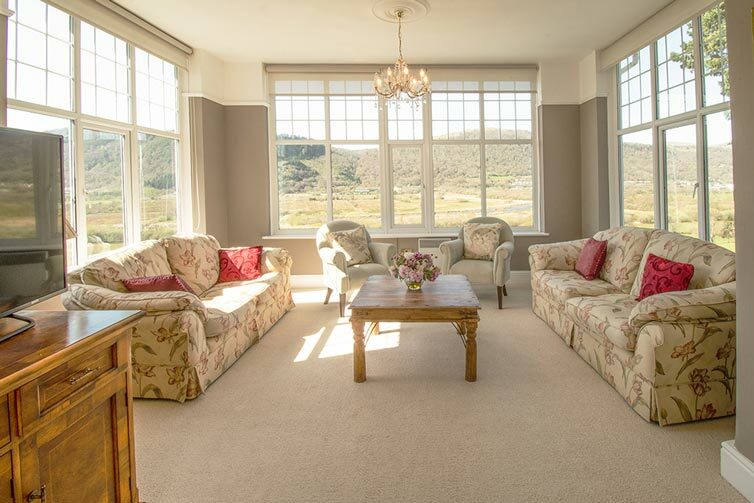 The Conwy Honeymoon suite has a queen-sized bed and a conservatory style spacious sitting room giving an enhanced panoramic view of the valley. There is a double sofa bed in the lounge area which is suitable to make this a family room. 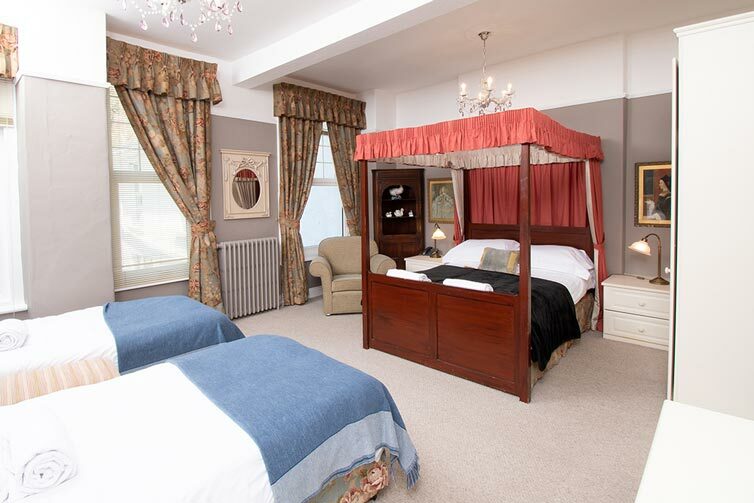 Caernarfon suite has a four-poster double bed plus two singe beds and the sitting room has French windows to a balcony with a small table and chairs for sitting out when the weather allows. 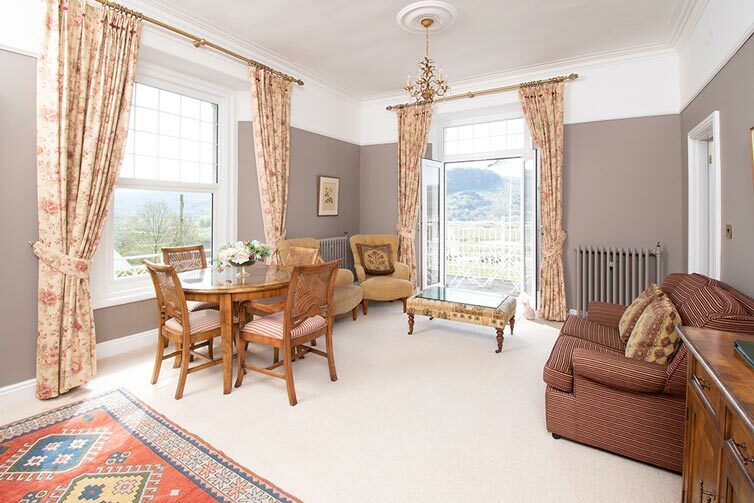 Criccieth suite has a king size double bed and the sitting room has French windows to a balcony with a small table and chairs for sitting out when the weather allows. There is a double sofa bed in the lounge area which is suitable to make this a family room. The Rhuddlan Suite has a double bed, two single beds and a double bed settee which can be made ready to accommodate a family of up to 6 guests, this room enjoys views of the surrounding woodland. All double and twin rooms have freeview TV, irons and ironing boards, hair-driers, extra room heaters and many other extras for your comfort and convenience. Harlech has a double bed and there is a step up to a small en-suite bathroom with a bath and hand-held overbath shower. This is a very pretty room on the side of the guest house and the windows have mountain views. 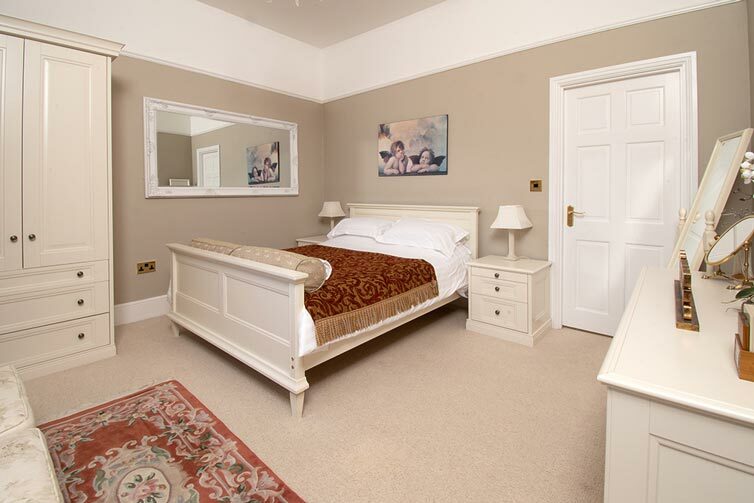 Penrhyn has a king-sized bed and the en-suite bathroom has both bath and shower. 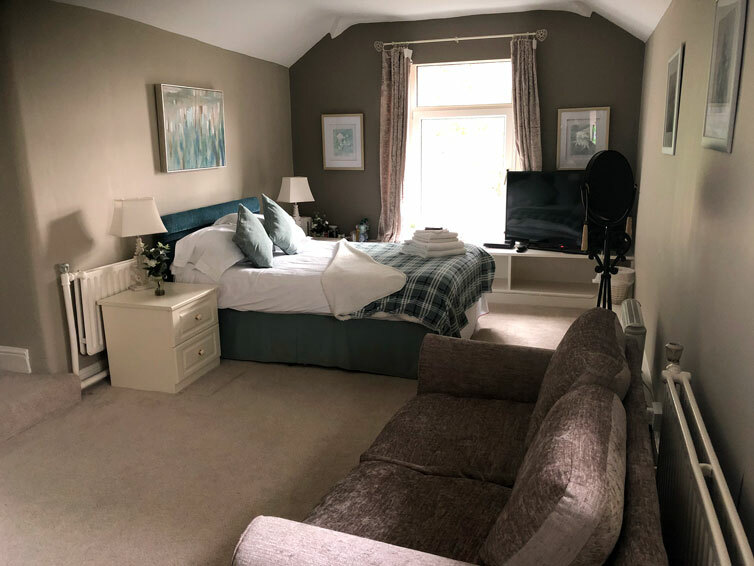 This room is at the back of the house and although there is not much of a view (roofs and trees) it is a very comfortable and stylish room and both bedroom and bathroom are on one level and are more spacious than Harlech or Powys. Powys has a double bed and there is a step up into a small en-suite bathroom with a bath and a hand held overbath shower. This is a pretty room decorated in French style with a view of tiled roofs and trees. 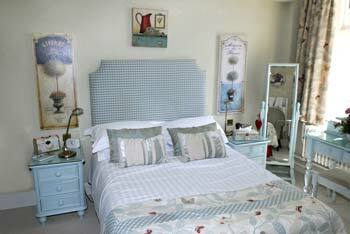 Deganwy has twin beds well separated to offer comfort and space. The room is on the back of the house with limited views of the woodland but it is spacious as well as stylish with a large bathroom having both bath and shower. 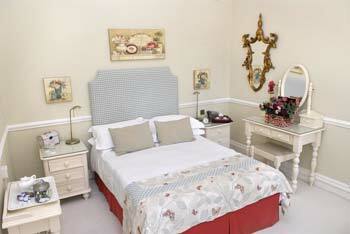 Chirk has twin beds and the en-suite bathroom has both bath and shower. This room is at the back of the house and is a very comfortable and stylish room.